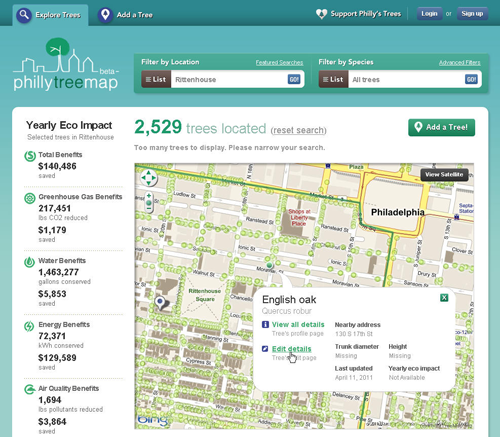 A screenshot from the Philly Tree Map | Image via azavea.comIn the city of Philadelphia there are approximately 148,533 tress. Well, at least that’s how many have been recorded so far on the Philly Tree Map. A crowd-sourced web mapping application, the Philly Tree Map is giving citizens the responsibility of recording the city’s canopy. With Mayor Nutter setting the goal of 300,000 trees to be planted in Philadelphia by 2015, the Philly Tree Map couldn’t have come along at a better time. About 20 percent of Philadelphia currently has tree and vegetative cover, compared with the 50 percent the city can support. Anyone can visit the site and view the maps of the 13-county, three-state range the project covers and search trees by location or species; but only logged-in users can map a tree. When mapping, users can also include a tree’s diameter, height and additional details about the tree condition and location—details that can potentially help those who care for city trees, like the Pennsylvania Horticultural Society and Philadelphia Parks and Recreation. The site also provides a yearly eco impact report that logs monetary, greenhouse gas, water, energy, and air quality benefits the trees are providing to their neighborhood. Robert Cheetham started the Philly Tree Map project in 2009 when his company Azavea received a grant from the USDA National Insitute of Food and Agriculture as part of their Small Business Innovation Research Program. The map was created with the help of crowd-sourced code from OpenStreetMap and the Urban Forest Map and was officially revealed this past spring during Philly Tech Week. Keeping the map accurate will be critical and there are plans for a system where reliably accurate users can gain greater editorial control. While there is no app for the map, there’s hope one will be created using follow-up funding from the grant. For now, users can access the site at phillytreemap.org. In a city without a tree map? The source code for Philly Tree Map has been released so other cities can start their own map too!